Lose the Suit. The move to replace a business suit with separates may lead some to believe that professional dress is dead. On the contrary, professional dress is alive and well, but in the form of woven jackets, narrow cut pants, pencil skirts and sheath dresses. The look is still tailored, but instead of a matched suit, it consists of a well-coordinated outfit that is neither body hugging nor unnecessarily loose. Patterns. Current patterns featuring graphic prints, florals, polka dots and gingham can all add interest to your wardrobe. Bold horizontal and vertical stripes (often in the same outfit) are making an appearance as well. The key to wearing patterns is to match the size with your body type (small, medium, large) and the look (angular, rounded, etc.) with your facial features. The pattern itself needs to appeal to you as well. Primary Colors. Kelly green, sunshine yellow, bright orange and marine blue are some of the cheery colors popular this spring. I suggest wearing only one of these at a time, and pairing it with a quiet neutral such as gray khaki, white or black. 70’s Styles. These looks are fun, but I recommend utilizing only one aspect from this decade, rather than wearing an exact replica of something you would have worn back then. (assuming you were alive and choosing your own clothes). Some 70’s styles to look for are long skirts, shirtwaist dresses, square necklines, bucket bags, chunky square heels, and jumpsuits (now known as rompers). Comfortable Shoes. 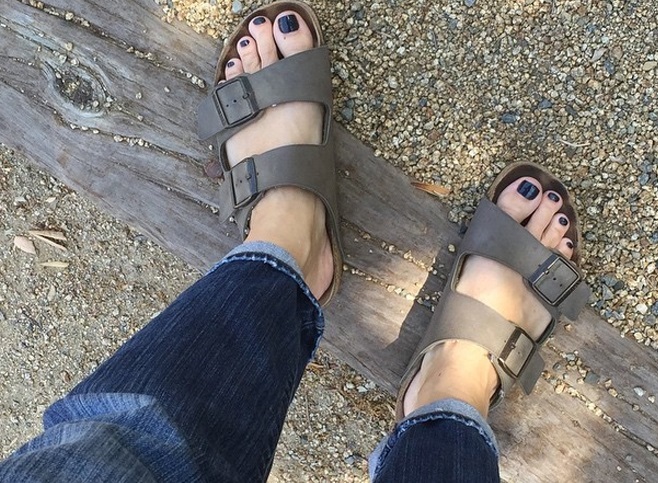 This is great news, and I’m sure you’ve noticed the current trend for women’s shoes to look a bit outdoorsy, like the old Birkenstock styles. Ballet and other flats are popular as well. This trend appears at every price point, from Kohl’s, to Jimmy Choo. The clunkier styles look best with a shorter skirt, a maxi skirt or dress, or cropped to the ankle pants. For longer pants and calf-length skirts I suggest choosing a sleeker style. Flats can mix in with pants or a shorter skirt. Stiletto heels are still with us, but there are many other trendy, more comfortable options to wear on your feet! Start your spring shopping by purchasing some of the currently available bright colors and patterns to add to your neutral wardrobe. Then add some fun (and comfy) shoes, and you will surely feel that spring is on the way.